After such a busy summer, we finally got our chance to go to Beloit. This city’s name was taken from a French word meaning, “handsome ground”. It was purposely made to sound like Detroit since that city then was seen as a great role model of prosperity. Beloit is now a thriving city of nearly 34,000. Beloit College for higher education ranks in the top 10 for quality instructors. One of the major industries is Hormel Foods. 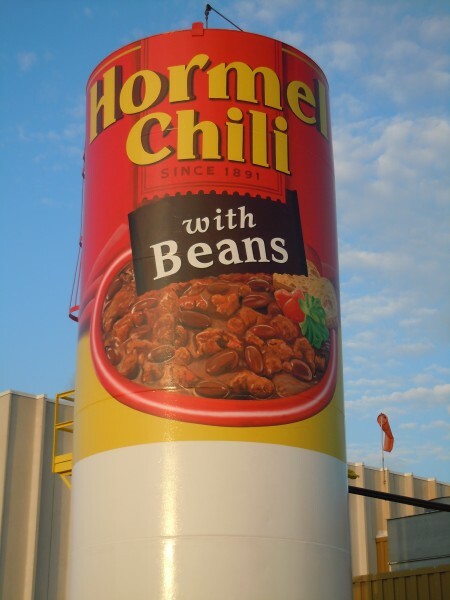 Beloit’s known for the 35-ft. high Chili can best seen from I-39 South / I-90 east just south of Exit 185. Beloit has a whimsical sense of humor as well. On July 1, 2006 the community got together to recreate Georges Seurat‘s painting, Sunday Afternoon on the Island of La Grande Jatte. This is their version called “Saturday in the Park With Friends”, real neat! Beloit is quite an artist’s city. We saw an example of that at the Wood Family Fishing Bridge by Siah Armajani. 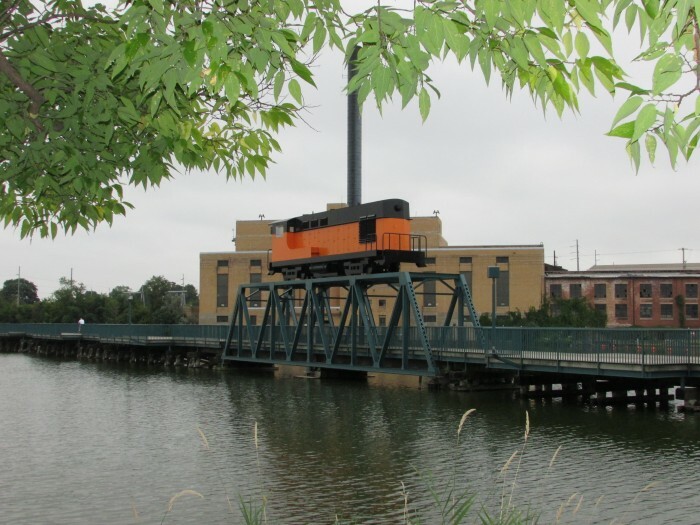 A duplicate of a railroad car sits atop a pedestrian bridge as part of the riverwalk path along the Rock River. What a great view! 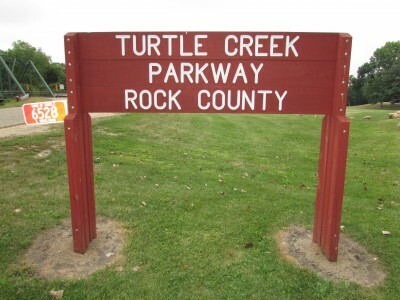 It’s accessible by parking at Riverview Park and walking the path. 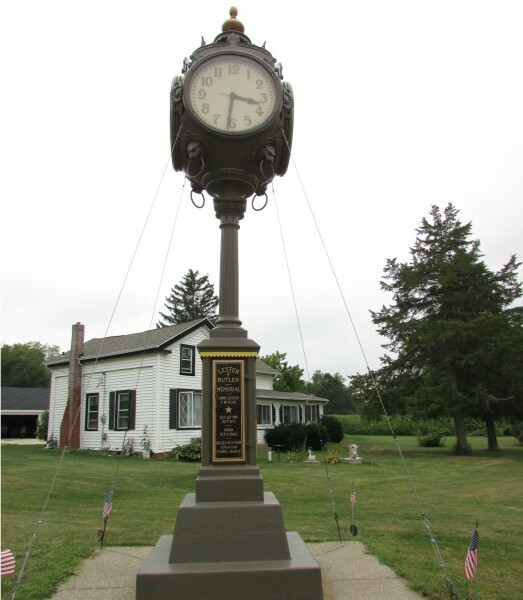 Nearby is the historic Stone Water Tower in Water Tower Park. 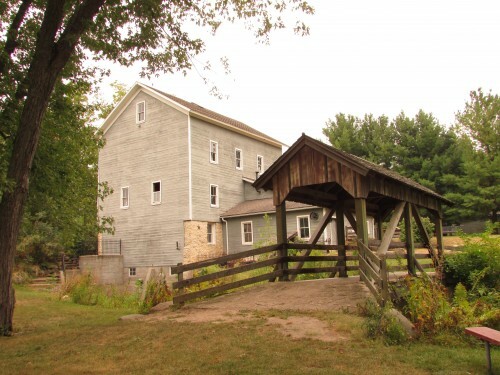 The balance of our day was spent at Beckman Mill historic site for their Heritage Days festival. I will tell you more about that in another post. After a great day at the festival, we headed to the northeast of Beloit in Shopiere to look at the historic Tiffany Bridge, still in use as a railroad bridge. It’s on South Smith Rd. 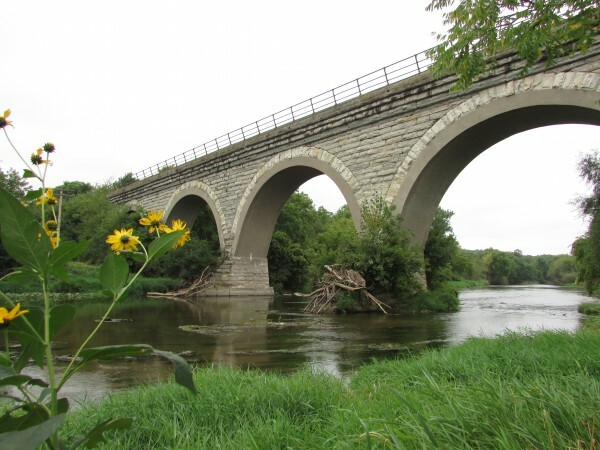 This is the world’s only surviving 5-arch stone bridge in existence. The view of the bridge when you are standing near is breathtaking. Before we got to the bridge we saw the Shopiere Clock, also a war memorial. It’s always time for a good time in Beloit! 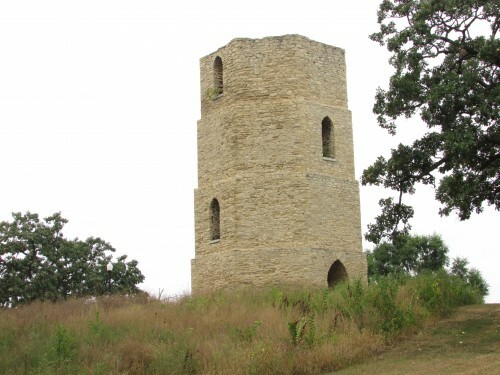 Hi Laurie, I liked your blog on Beloit. Once again I learned something new. Thanks for the suggestion Mom Requests are indeed welcome, we can’t think of every town 🙂 The next town on our list is Evansville on Monday. That town is VERY interesting. Maybe we will do Richland center after that. I am welcome to any ideas you or any of my readers have of where to go. I would love to get to Rhinelander sometime, but it’s too far for a day trip and we would have to stay a night or two.